Internet Explorer 8 was released a few days ago, on 19 March after almost 3 years of development and it introduces a series of useful features to the browsers world. It will be delivered as an update for Windows Vista, via Windows Update and it will also be the default browser for the upcoming Windows 7 operating system. In this article I will talk about the features and improvements introduced by Internet Explorer 8 and I will also show you how to use them. Lets see what each of these features does and how to use them. 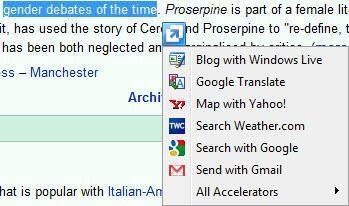 Accelerators are best described as very useful right-click menu options. For example, you can simply select a text or a picture from a site, click on the blue icon that show's up near your selection or make a right-click and choose what you want to do with it: blog about it, send it by email to someone or just search on Google for more details. Practically this selection based search eliminates the need for copy and paste actions and it helps you save time when doing routine browsing tasks. 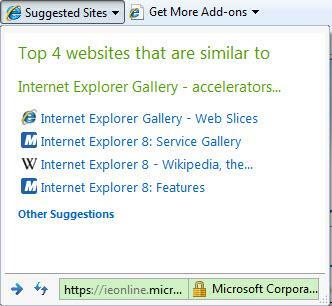 If you go to the Internet Explorer Add-Ons Gallery, you can choose from lots of accelerators that will allow you to easily blog, bookmark, email, find, share, translate or do any other action that you have in mind. Think of web slices as visual bookmarks. You can add any site which offers support for this feature. Once added, the site will have it's own button in the top bar, after the Favorites button. 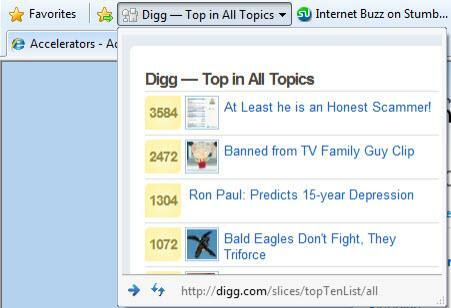 A web slice can offer features such as: see the latest top on digg.com, check out the internet buzz on StumbleUpon, etc. The web slices are constantly updated each time you open Internet Explorer 8. To add web slices to your Internet Explorer, go to the Web Slices Gallery. At this moment only a few websites support this feature, but the constant increase in popularity of the browser will determine other sites to enable it. For now, Web Slices is a nice idea but it does lacks some functionality. For example, it would have been great to be able to group more web slices under a specific tag or category so that your favorites toolbar wouldn't take too much space. You can choose to show just the first few letters of the web slice or just the icons, but sometimes that's not very intuitive. The Suggested Sites feature is a permanent bookmark on the Favorites toolbar, right next to the Web Slices. Its functionality is quite self-explanatory, it gives you a few suggestions of similar websites that you might like, based on the website you currently visiting. By default, this feature is turned off. To enable it, click on Suggested Sites and then on the 'Turn on...' button. 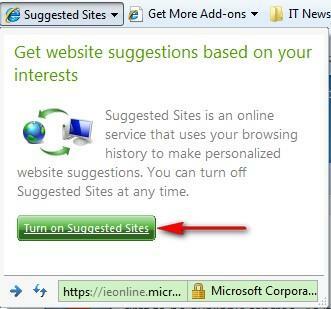 Alternatively, you can do this by clicking on Tools -> Suggested Sites. Suggested Sites is automatically turned off when the user enables InPrivate mode or when visiting secured sites which use encryption or other safety features. 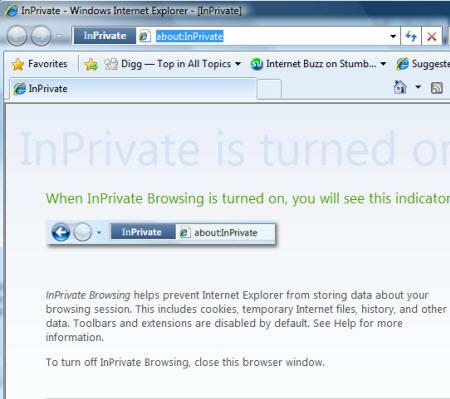 When browsing using the InPrivate mode, Internet Explorer will not store any data about the current browsing session. 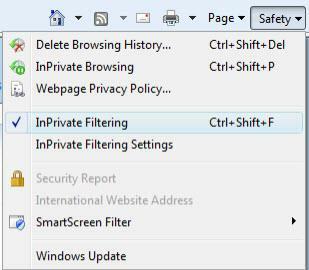 Internet Explorer 8 integrates the InPrivate Filtering feature which notifies the user of third-party content that can track browsing history and allows the user to block specific content or entire websites. By default InPrivate Filtering and InPrivate Browsing are turned off. If you want to enable them, click on Safety from the top right menu and select InPrivate Filtering or InPrivate Browsing. 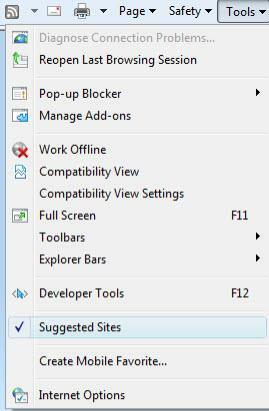 Then choose if you want to manually block content or let Internet Explorer do it for you. The autocomplete function is faster and more accurate. Also, the address bar has a domain highlighting feature for added security so that the top-level domain is shown in black whereas the other parts of the URL are grayed out. Domain highlighting cannot be turned off by users or web sites. Tabs with different pages from the same site, have the same color so that they can be easily recognized. The favorites bar received lots of improvements with the added Web Slices and Suggested Sites features. The zoom-in/out functionality has been improved. Now the text is being repositioned correctly so that there will be no horizontal scroll bar. SmartScreen Filter is in fact the phishing filter from Internet Explorer 7, renamed and improved. The rendering engine has been significantly modified and improved. However, this might cause some problems with older sites which may not be displayed correctly. To fix this problem you will have to use the compatibility mode which runs the sites using handling methods similar to the ones from Internet Explorer 7. 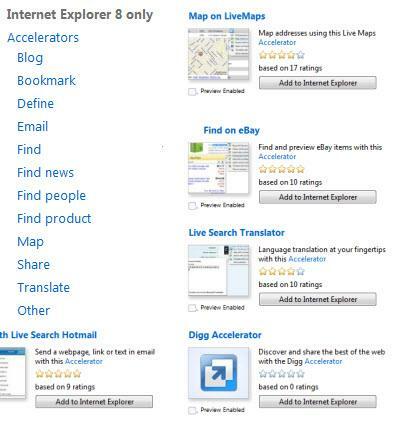 As you can see, Internet Explorer 8 brings lots of improvements. It managed to evolve quite a lot compared to previous versions and, with further improvements and some good add-ons, could win back the hearts of internet surfers. If you have already used Internet Explorer 8, don't hesitate to share your experience by leaving a comment. I would say that IE8 is now at least on par with Mozilla but with one fault; starting a new tab is SLOW. That is a deal breaker for me. The accelerators are neat but KALLOUT matches that feature nicely for Mozilla. I see no reason to switch from Mozilla at this time and learn a new GUI. I spent quite a bit of time cleaning up the mess above the viewing area, getting rid of useless toolbars and junk in IE8. I also had to apply the registry patch to put the file menu above the address bar. I want the maximum space allocated to my web window, not the extra stuff MS wants to put there.